Before heading off on the iconic Larapinta Trail through Central Australia’s West MacDonnell Ranges, we pivot 180 degrees to venture where mostly only locals roam. Welcome to the East MacDonnell Ranges. 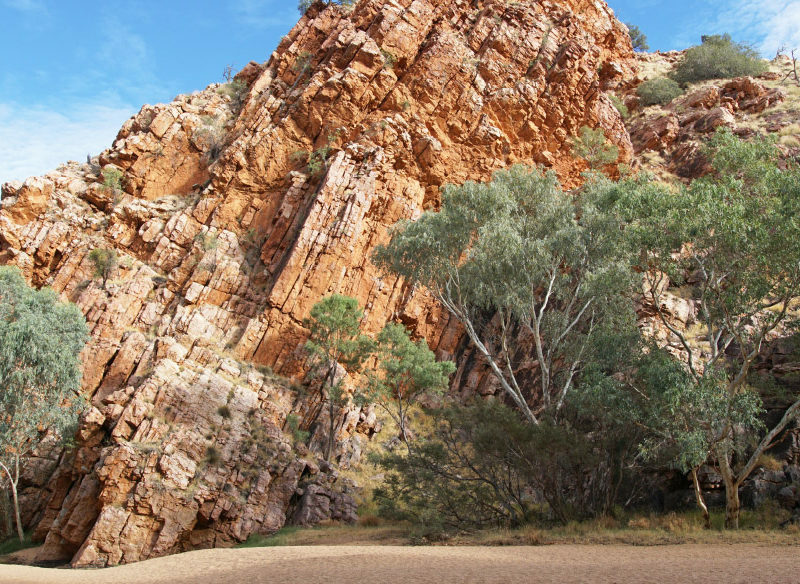 The East MacDonnell Ranges, not as well known as the West MacDonnell Ranges, provide incredibly beautiful scenery for bush walking, camping and four-wheel-driving. The East MacDonnell Ranges can be found for 150km just east of Alice Springs. QantasLink and Virgin Australia fly direct to Alice Springs from most capital cities. Stay in the heart of the East MacDonnell Ranges at Hale River Homestead, accessible by 2WD; from $30 per night for an unpowered site to $240 (two adults) in the Homestead. Back in Alice Springs, Squeaky Windmill has boutique glamping complete with heating, bathrobes, and marshmallows to roast over the fire. From $175 per night for two people. Experience the East Macs between May and September when days are warm and dry. Summer is too hot for hiking but perfect for the magnesium pool at Hale River Homestead. You’ll want a 4WD or trusty tour guide to get you there, and then short walks are the best way to experience the gorges and nature parks of the East MacDonnell Ranges. Take sturdy walking boots, plenty of layers for morning and evening and expect to rug up at night when temperatures drop. A hat, sunscreen and water bottle are other backpack essentials. I’m completely surrounded by sheer red and purple quartzite rock faces and ghost gums looking as if they’ve been caught exposed, their bare white trunks glowing for all to see. The ground is coated in deceptively downy-looking spinifex but I carefully step in Filippo’s footsteps underneath an impossibly blue sky. So far today i’ve seen only two other humans. I’m in Trephina Gorge, a little-known nature park 85 kilometres east of Alice Springs where russet strata, blue mallee and sandy creek beds bring the colours of the desert into vivid detail. This area is significant to the Eastern Arrernte Aboriginal people because it is part of the Wallaby Dreaming Trail, and was also once part of the early settlement of Central Australia. We may be close to the geographical centre of Australia, but we’re not going without good, strong Italian coffee this morning. Bucking the trend of almost every tour I’ve come across, my new friend Filippo Gelado from Outback Elite Tours pulls a gas burner and Italian-style moka pot out of his backpack after our hike as naturally as one would expect a thermos and packet of Monte Carlos. He’s made rock cakes studded with sultanas, too. God bless the Italians. So why go east when everyone is heading west? Standing in awe at the base of the largest ghost gum (Corymbia aparrerinja) in Australia, I believe it’s for moments like this. Standing sentinel inside Trephina Gorge, this 33-metre giant is estimated to be over 300 years old. Filippo has designed a highlights reel of sights for me today on a private tour. Though he’s a long way from home – having grown up in a small village outside Milan – you’d swear he was born with red dirt in his blood, even when he admits he’d never even been camping before backpacking through Australia with his then-girlfriend, now-wife in 2011. “The idea of camping we have in Italy is a crowded place,” he explains. “It’s the cheapest accommodation you can have, full of kids. It didn’t make sense to me then. I’m quickly discovering the true beauty of the Red Centre is in its isolation – the wide open spaces with no one to share them with – that inspires travellers to wander this way. “Sometimes people don’t really want to stay in a crowd; they come to the outback with the ‘outback’ idea, like ‘I don’t want to see anyone’,” Filippo says. to conquer. Nature parks and significant rock art sites are interspersed with sprawling cattle stations and private land. Perhaps the most obvious difference on this side of the ranges, I’ll later come to realise, is the ghost town of Arltunga where Central Australia experienced its first gold rush in the late 1800s. At its height, Arltunga supported a population of 3000 people, many of whom worked and lived in extreme conditions in the small, remote settlement, battling stupefying heats with little water or fresh food. Walking through the preserved ruins of the police station, gaol and government works buildings today, it’s hard to fathom just how remote and tough this place would have been 130 years ago. Half an hour’s drive away, we cross the cattle grid and pull into Hale River Homestead at the Old Ambalindum Station. The station played its own role in Arltunga’s history, with Irish prospector Frederick Cavenagh – who worked as a clerk in the government works – taking on the lease to raise sheep and grow vegetables, partnering with neighbouring station Clareville to supply sustenance to miners. Today, the Leigh family own Hale River Homestead – a “veggie patch” in terms of its size at a mere 60 square kilometres, as Filippo puts it – which makes a welcome stopover for travellers on the infamous Binns Track, as well as an attractive day trip for Alice Springs locals who come to cool off in the magnesium pool during summer. Essentially a shipping container with a deck, the pool has five-star views, looking out over a windmill and the heritage-listed ruins of the station’s original shearing shed, which will be restored in the future. “The beauty of the east is you’ve got the natural beauty but you’ve also got the human history with Arltunga and, with us now, you’ve got some pastoral history too,” Lynne Leigh says as we devour her burgers for lunch in ‘The Workshop’ – a converted shed that serves as the hub of the campground and other accommodation on the property. Loaded with pickles, jalapeños, beetroot, pineapple, egg and bacon, it’s easily one of the best Aussie burgers I’ve ever had. Some places make you feel immediately at home and this shed, among the riot of Australiana and antique farm memorabilia, is one of them. Lynne’s daughter Sophie takes us on a tour of the property, to the retro caravan – part of a package deal when they bought a backhoe – where her son, David, does his School of the Air lessons. Curious guests can pay a gold-coin donation to sit and watch as he dials in each morning from his private classroom. The cottage and homestead on the property date to the early 1900s, with renovations from the ’50s and ’60s perfectly maintained. “It’s a bit like stepping back in time,” says Sophie as I admire the retro kitchen in the cottage, which originally served as stockmen’s quarters. What is even older than the gold-rush history of the East Macs, of course, is the history of the Arrernte people and the rock art found at several sites nearby. “We’ve got some time – I want to take you somewhere special,” Filippo tells me as we wave goodbye to Lynne and Sophie and start to head for N’Dhala Gorge Nature Park. A short walk takes us into the narrow gorge where 6000 individual petroglyphs, or rock carvings – some as old as 10,000 years – decorate the red rock walls. This is the story of the Caterpillar Dreaming, with intricate circles and lines showing caterpillars transforming to butterflies. Many were done by pecking: holding a sharp stone against the rock and striking it with another, heavier stone. The Caterpillar Dreaming is also told at Emily Gap – a small chasm in the Heavitree Range – where we stop on our way back into Alice. 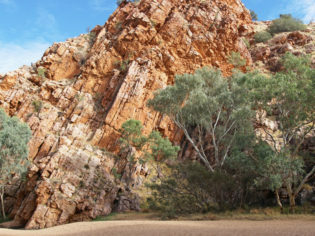 This site is part of the storyline for the Three Caterpillars, Yeperenye, Ntyarlke and Utnerrengatye, which are the ancestral beings for the Alice Springs area. Vivid lines of ochre mark the walls of this open-air gallery, in the spot where Intwailuka, an ancestral hero, is said to have cooked and eaten caterpillars on his Dreamtime journey. The sun is close to setting as we drive back into Alice, at the crossroads of the East and West Macs. Tomorrow I’ll set out with a group to hike for five days along the Larapinta Trail in the West MacDonnell Ranges, which is sure to be an unforgettable experience. But with little exertion and gourmet coffee to boot, the East Macs have already provided a microcosm of the Red Centre in just one day.